Our Source Card procurement card makes buying easier for you, lowers your procurement costs and helps track and control job spend. With preapproved transaction and credit levels, cardholders simply have to pick up the phone and place an order or visit any Source Atlantic branch. 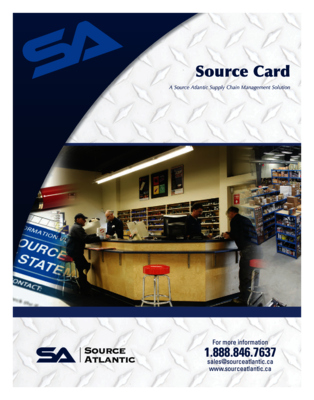 Our Source Card program provides procurement managers with a monthly comprehensive statement of every individual item purchased, by cardholder, by job or work order number.